This is another recipe that there seems to have a million variations. Some people put the tots on the bottom and others top the tots with cheese. This isn’t an all the time recipe for us but is always a hit at church potlucks and family reunions. Preheat oven to 425 degrees. In a large skillet brown the ground chuck and chopped onion until the meat is cooked and onion is softened. Drain any fat off and mix in the cream of mushroom soup and season to taste with salt and pepper. Spread in the bottom of a 9 x 13 baking dish, sprinkle with cheese and top with the tots. Bake for 30-45 minutes or until bubbly and the tots are golden and crispy. Let rest for 5-10 minutes before serving. This can easily be cut in half for a smaller family by using 1 pound of ground chuck, half a bag of tater tots, and 1 cup of cheese; the rest of the ingredients stay the same. Bake in a 9 x 9 dish for the same amount of time. You can also substitute ground turkey or other ground meats if desired. 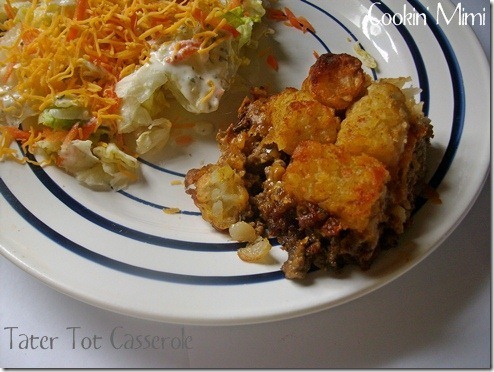 I’m glad to see I’m not the only one who makes this tater tot casserole! My husband won’t eat it anymore, but I love it! Oh wow! Very nice. I’ve never seen this, I must try it. Yumm – this is one of mt family’s favorites. I take advantage of that fact and load mine up with veggies (: I could sure go for a plate of yours right about now! I’ve made something similar to this for years without cheese and using cream of celery soup. It’s one of my husbands favorites. Got to try it with cheese next time! I use onion soup mix and frozen peas and carrots in mine.. Always a hit!